Playbooks are big. There are lots of tools and never ending content around playbooks for marketing and sales. Inevitably, these playbooks are intended to guide us through our marketing and sales processes–providing us relevant questions and content to move the customer through their buying process. Classically, we have always thought of buying as a linear process: Define a problem or opportunity to be addressed, identify needs/, goals, assess alternatives to meeting those needs/goals, make a decision, implement. We map critical buying activities, informational needs, decisions, exit criteria for each stage of the buying process. All to help provide the customer a roadmap through this linear process. This is done in the spirit of being helpful, and facilitating the in an orderly, effective, and efficient navigation through this process. We align our own marketing and sales activities to this buying process with the intent of creating value for customers as they navigate the process and to maximize our ability to influence their decisions about the solutions they choose. We optimize our own organizations around this model–creating awareness, driving demand, creating MQLs which, hopefully, SDRs convert to SALs passing them on to AEs to qualify, discover, propose, and close. We develop playbooks and battlecards to help us navigate this buying and selling process. We provide roadmaps as some form of “customer playbook” to help them navigate their process, addressing the issues we think they should address. All vert logical, straightforward, and focused on helping customers, marketing, sales converge on a decision in very predictable ways. But is that really how buyers buy? The more we understand the buying journey, the more we understand it isn’t that logical flow. Some years ago, Hank Barnes describe it a “Squishy,” (I still think that’s an apt description). More current Gartner research shows it as chaotic. It proceeds in stops and starts. It circles back on itself. It may be budgeted, or it may also be an budgeted initiative. Through the process, customers are seeking information, not only about products, but what others have done, how others have approached similar problems, trends/issues, events that impact what they are trying to do. There is no “single source” of information they rely on, they leverage multiple information channels simultaneously–web sites, sales people, experts, peers, and others. In the end, the majority of buying processes end in no decision made–less because the customer can’t select a solution, more because they can’t align themselves around a work plan or navigate the buying process. And then it may start again–perhaps a few months or a few years later. As one reflects on this “journey,” some key ideas come to mind. Our marketing/sales playbooks focus on what we’d like to see happen, but aren’t aligned with what really is happening. Our selling processes tend to assume a linear buying flow, so our selling processes need to be tuned to reflect the chaotic flow of the buying journey. 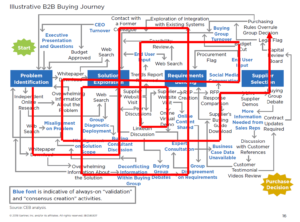 More importantly, this chaotic flow is not what the customer wants to happen, it’s more a reflection of the internal complexities and dynamics that exist within the customer’s own organization. This presents us a huge opportunity. How can we help the customer reduce the complexity, simplifying what they are trying to achieve? How do we help them simplify and navigate this process more successfully? What can we do to help them succeed–because if they don’t succeed, we never will. This requires us to develop new skills and capabilities. Critical thinking/problem solving skills–to understand and help the customer make sense of what’s happening and how to proceed. Project management, facilitation skills to help the customer navigate the complexity of their organizations and their “process.” Curiosity to understand what’s happening and why, to understand the issues that serve as roadblocks to the customer’s ability to make progress. Agility/nimbleness/flexibility–to be able to adapt to where the customer is, without being constrained by our own views of the process. There is not playbook for buying, consequently, we must rethink our own playbooks, if we are to help our customers succeed.